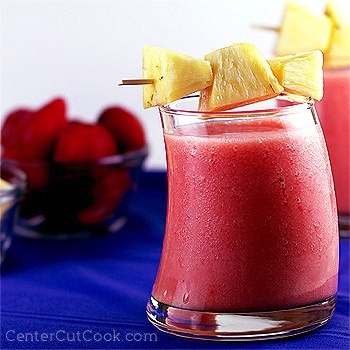 I can’t think of a better way to start your day than with this refreshing Strawberry Pineapple Smoothie! Are you looking for ways to incorporate more fruits into your diet? Or, are you wanting to get your day started off on the right foot? If you answered yes to either of these questions, you must, I mean must try this Strawberry Pineapple Smoothie! It promises to fill your little soul with lots of healthful, yummy fruits that will leave you feeling satisfied and ready to tackle the day ahead of you. Smoothies have become a regular part of my diet, ever since buying a Vitamix blender. I’ve tried SO many combinations of fruits (I could probably open my own Jamba Juice), and out of all the combinations, this Strawberry Pineapple combo is definitely ranked up there as one of my favorites. There are so many different types of smoothies out there, the ones with yogurt (like this Strawberry Smoothie with Greek Yogurt), the ones without, and then there’s the kind that use milk or even orange juice. Each provides a different taste and texture and over time, you’ll learn what your preference is. Lately I’ve been on a ‘fruit only’ smoothie kick. By that I mean that the only ingredients in the smoothie are simply fruits. The only downside to this type of smoothie is that it doesn’t offer you any type of protein, however, if you find a protein powder that you like (protein powders are not all created equal, some leave a terrible after taste! ), you could easily add some in. PS: I think I have a thing for pink beverages lately. If you have a favorite smoothie combo, feel free to share in the comments below! Place all ingredients into your blender, and blend on high until desired consistency is reached. You may need to adjust the amount of water/ ice cubes you add to get the consistency just right. Because I used frozen strawberries, I needed almost a full cup of water to get the consistency to where I wanted it to be. Yields 2- 8 ounce servings.